Extremely cold air comes every winter to at least part of the United States and affects millions of people. Arctic air and brisk winds can lead to dangerously cold wind chill values, resulting in frostbite and hypothermia. About 63% of weather-related deaths in the U.S. result from exposure to excessive cold and/or hypothermia. Extreme cold can also lead to significant damage to buildings and infrastructure, resulting in $500-million in average annual insured losses. This lesson describes the potential impacts of cold wind chill values and extremely cold temperatures, and explores ways forecasters can communicate the impacts of these weather events along with mitigation strategies. Learn something new every time! Advise checking hyperlinks in this presentation. Some are broken. Good information in an easy format to follow. Lesson is interesting but it's a bit difficult for understanding for me as I don't know geography of USA. I think it would be better if there will be some remarks about it. Asking NWS meteorologists to read a windchill chart seemed well below the level of appropriate training for professional forecasters. Also, the PNS can be used for safety rules as noted below... "public education".Mission Connection. The Public Information Statement (PNS) is an alphanumericmessage used to distribute information regarding hydrometeorological events; public education;National Weather Service (NWS) service changes, limitations or interruptions; and specialguidelines for interpreting NWS data. The PNS is used by a wide variety of users and partnerssuch as the general public, emergency managers, and the media. Very helpful in tracking cold weather. Coming from a country where we can b subject to severe cold but don't have cold or windchill advisories, this course has been really interesting. I wish we had the forecasting services of USA! Muy buena y amena, con información clara. This helped me to become a better communicator of risks from extreme cold weather. 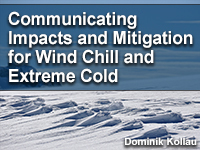 Excellent and comprehensive course on how to communicate Extreme Cold and Wind Chill impacts to public agencies. enjoyed the way the information was presented, helped my overall understanding of these subject. This is a good, easy to understand lesson. I enjoyed it and would recommend it to others, particularly in the Community Emergency Management field. Good outline for forecasting extremely cold weather forecasting. I thoroughly enjoyed this module. It contains a lot of information on how to prepare yourself for extreme cold and the Watches and Warnings that the NWS issues for wind chill. Describe weather events that potentially lead to wind chill and extreme cold advisories and warnings. Recall the thresholds for wind chill and extreme cold advisories and warnings. Describe how wind chill and extreme cold can impact the general public. List key local partner agencies and public jurisdictions that may be impacted by wind chill and extreme cold. Describe how wind chill and extreme cold can impact both routine and emergency operations of local partner agencies and decision-making by these agencies. Describe strategies that mitigate wind chill and extreme cold hazards. List and describe the communication channels that would be effective in distributing information about wind chill and extreme cold hazards and associated mitigation strategies. Formulate clear, logical, cohesive forecast messages for wind chill and extreme cold events that describe the potential impact on the community and possible mitigation strategies.